With convenient interstate access, our office is easily reached from Boone, Hendricks, Hamilton, and Marion counties. We are discreetly located in the heart of an upscale residential area. The Stonegate neighborhood has a small local business district across the street from its community Meeting House. 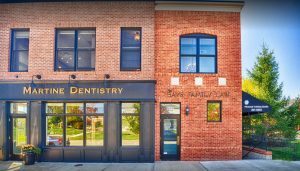 We are at the intersection of Stonegate Drive and Westminster, just across the street from the Carolina Grill restaurant, in the same building as Martine Dentistry. Take Exit 130 – Zionsville/Whitestown. Follow Whitestown Parkway for 1 mile to Stonegate Drive. On the way, you will pass a Lowe’s on the right and a McDonald’s on the left. Turn left (north) onto Stonegate Drive. Follow Stonegate Drive for approximately ½ mile. On the way, the road curves to the right and passes Stonegate Elementary.